The production work of surveying buildings began in earnest today. The first area the team visited was Dulag, a town about 25 miles south of Tacloban. The team was accompanied by local civil engineers from the Department of Public Works and Highways (DPWH). This was one of several towns visited. The purpose was to compare experiences and the conditions of buildings at various distances away from the storm path. One of the first things that is done when we enter a town is introduce ourselves to the local officials. This is generally through the mayor’s office. It is a courtesy, of course, but it is also a chance to conduct interviews about the details of the storm’s arrival. Most of the construction in this part of the Philippines is reinforced concrete with concrete masonry infill walls. The roof construction is generally wood or steel trusses with galvanized metal panels. 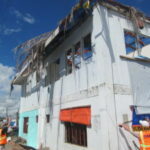 For most buildings, the concrete framing survived the storm effects very well, with minimal to no effects noted. Roofing damage, however, was almost universal. This is as expected and consistent with the outcome of typical storms. There are exceptions, of course, and those will be one of the important considerations to incorporate into recommendations developed from this project. One of the consistent reports we heard from local officials today is how much general damage was related to poor construction methods and materials. 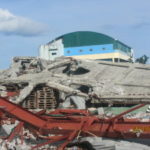 Private commercial construction was cited as the primary problem. While building permits were reportedly required, compliance with the process was not enforced well. Inspection departments exist and function well enough with DPWH, for example, but apparently not for typical commercial buildings. The other thing heard is that construction methods were poor, leading to construction that did not survive the storm well. Away from Manila, English is not spoken nearly as abundantly or as well by the Filipinos. The engineers from the DPWH generally understand and speak English, but it is clearly not their primary language. The language spoken most commonly in this part of the country is Waray, and there are many dialects in use. For this reason, the team has interpreters for its use. They are law students from the local university and their English is very good. They understand the intent of the interview process and are able to formulate questions and interpret responses helpfully to get the information being sought. They are a great asset to us. The team really needs their help at meal times. Even if some of the menus are in English, how things are prepared and will be served is unknown to us. We are definitely at the mercy of the locals. The weather has been good for the work. We have had clear skies and no rain. It is not the rainy season now, but some rainy conditions would be expected. The weather is warm and muggy, with temperatures about 90 degrees F and high humidity. Jet lag still seems to be a factor. With a 12-hour time difference from the US, there is some fatigue at the end of the day. That is to be expected and seems to be diminishing as members acclimate to local time. 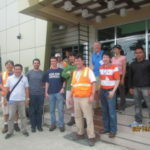 On Saturday, May 3, a team of seven civil engineers from ASCE’s Technical Council on Forensic Engineering, in cooperation with the Technical Council on Wind Engineering, left for the Philippines on a week-long mission to conduct post-disaster assessments, documenting evidence of structural and geo-system damage to historic and residential structures and public infrastructure. Mark E. Leeman, P.E., M.ASCE, vice president of Facility Engineering Associates of Fairfax, Virginia, chronicles the team’s experiences in this exclusive daily report for ASCE. This is the third installment in the series. ASCE , thru PICE, an do something with it.